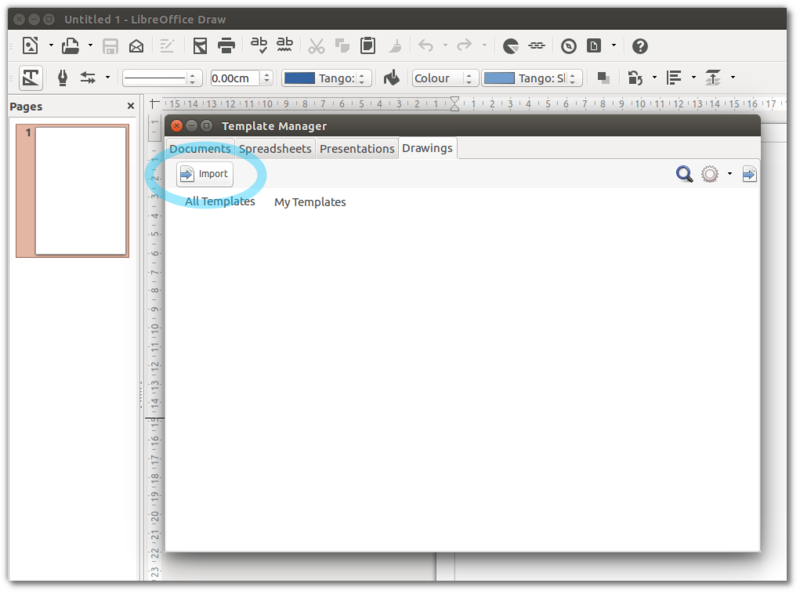 In older LibreOffice Versions it was (and inand in AOO it is) possible to import Styles from other documents via menu File - Tempates - Organize. So it was possible to import required line styles or what ever to a document where the styles will be required. In my Version: 4.2.4.2 I can't see anything similar. Where has the function gone? Help still mentions the missing menu Item, but is full of errors like "Bug 77581 - Template error". Who can Help? The easiest way I found for me: Open a document, which has the desired style. Make a new page, draw an object and assign the desired style to this object. Grab this page from the page pane and drag it over to the document, which needs this style. After you have dropped the page in the page pane of the target document, the used styles are available and you can delete the temporarily pages. This does not only copies the current style but parents too. But it only works, when the style not already exists in the target document. An update of an existing style or merging of styles is not possible this way. Thx, that works. For a first test I simply copied all slides of my template Draw document to the document where I need the styles, and that action made the styles available. As expected also after I deleted the template document pages the styles still were available. But that is a very inconvenient proceeding, a fix for fdo#60589 will be required urgently. 3 karma points are required to upload files. Done. Does that do it? or do you mean the (old?) "load styles" dialog? Here is the Screenshot from an old LibreOffice version of the function I need. I can't find that in current version.